Bear Lake is located approximately 3 miles from the town of Seward, and offers occasions for both adventure and relaxation. With glacier-draped mountains as a dramatic backdrop, the setting couldn't be more stunning. The lake and its environs afford countless ways to enjoy the tranquility of the lakefront setting or to find adventure. Take a canoe or kayak to watch the salmon swim upstream during the height of the sockeye run. Set off from the back door and hike the historic Iditarod trail, or climb 4,300-foot Tiehacker Mountain. Or, catch a ride on a float plane and fly over some of Alaska's remote lakes and glaciers, or search for wildlife in the hidden valleys and peaks of the Kenai Peninsula's wilderness. Whether it’s relaxation or adventure or a bit of both that you’re seeking, Seward, Alaska, is the destination for you. The seaport town, located on Resurrection Bay on the Kenai Peninsula in the South Central Region of the state, is conveniently situated for enjoying many of the wonderful activities Alaska has to offer. • Take a day cruise into Kenai Fjords National Park for whale watching, and wildlife and glacier viewing. Visit Kenai Fjords Tours or Major Marine Tours for more information. • Visit the Alaska Sea Life Center. • Walk to Exit Glacier or hike to the Harding Icefield inside Kenai Fjords National Park. Visit the Visitors Center, operated by the National Park Service, at the base of the glacier. • Fish for Alaskan wild salmon, halibut and more on a charter boat leaving from Seward Boat Harbor. • Hike in to try your luck fishing for Dolly Varden, Trout or Grayling at nearby lakes and streams (fishing in Bear Lake itself is, unfortunately, not allowed). • Take a guided fly-fishing excursion with Dragon Fly Fishing Guides. 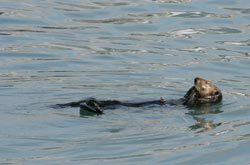 • Take a sea kayaking trip to explore Resurrection Bay and its wildlife up close. • Learn the basics of dog mushing with a tour at Iditarod winner Mitch Seavey’s Kennels. • Take a walking tour around Seward to visit the many murals painted by local artists. • See glaciers and spot bears from the air on a flightsee. • Explore any of the numerous mapped and improved trails for hiking throughout Seward and extended area. We keep a notebook of all the local hiking trails at our B&B for guest use. • Shop the various stores located in historic Downtown Seward or in the Small Boat Harbor. Local galleries offer native and local arts and crafts, gifts and more. • Take a Dinner Cruise to Fox Island or enjoy a variety of cuisines and seafood offerings at the many restaurants in Seward. • Fill in your own adventure in Seward or Kenai Fjords National Park: ________________________. Visit Seward.com and find more on the services, activities and charters available in our community. • Visit the Alaska Sealife Center—it's open year round. • Snowmobiling on the Lost Lake Trail is a popular Alaskan pastime. • Snow Shoeing the various improved trails in Seward and extended area. • Seward’s active Nordic ski community keeps a variety of trails open and groomed for skate and classic. Learn about ski techniques, get trail maps and find current trail conditions at the Seward Nordic Ski Club. Check out Seward.com for more information on activities and attractions in the Seward area. Find out more about Kenai Fjords National Park, or more about the activities available in the Chugach National Forest.